Freezing Eggs To Make Babies Later Moves Toward Mainstream : Shots - Health News The American Society for Reproductive Medicine has concluded that freezing women's eggs to treat infertility should no longer be considered "experimental." The practice has long been controversial. Some critics worry the policy shift will encourage more women to turn to egg freezing to stop the biological clock. Doctors who specialize in treating infertility are making a big change in their position on a controversial practice. The American Society for Reproductive Medicine (ASRM) has concluded that freezing women's eggs to treat infertility should no longer be considered "experimental." The group plans to officially announce the change on Monday. More and more women are using frozen eggs to try to have babies. Some older women use frozen eggs donated by younger women. Some younger women freeze their own eggs while they finish school, focus on their jobs or keep looking for the right guy. That's why Jennifer Anderson did it last year. "I really wanted to have the traditional experience of falling in love and getting married, and then having children. But I know every person's life path is different, and it hadn't worked out for me yet to fall in love and get married," says Anderson, 40, a consultant who lives in Arlington, Va. So Anderson went to the Shady Grove Fertility clinic in Rockville, Md., to freeze some of her eggs. "I guess I feel like I've stopped the biological clock, to some degree. That this gives me a few more years to find what it is that I'm really looking for," she says. The practice of freezing eggs has long been controversial. Many experts argue there's too little data on how well it works or how safe it is. So they've mostly recommended it only for women whose fertility is at risk because they are undergoing chemotherapy or have some other medical problem. But Eric Widra, an infertility doctor at Shady Grove, says that's changed. He chaired the Society for Assisted Reproductive Technology (SART) Practice Committee, which prepared the report. 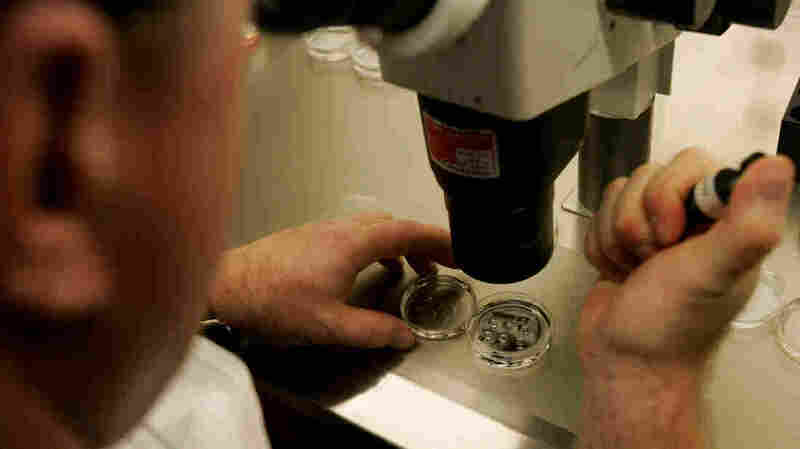 It was the first time the group had reviewed egg-freezing since 2008. "We no longer think that it should be covered under the experimental label. Sufficient studies have been done to warrant considering this a clinically available technique," Widra says. The report reviewed nearly 1,000 published studies. Egg freezing and thawing techniques have gotten a lot better, he says. "The available data for egg freezing indicate that it is safe and effective and has a good probability of success," he says. So far, babies born from frozen eggs seem to be healthy. And a woman in her 40s or 50s seems to have about the same chances of getting pregnant as a woman in her 20s or 30s if she uses frozen eggs from a donor that young. "We think that is a reasonable expectation going forward," he says. But the new policy, which is being published in the society's journal Fertility and Sterility, warns clinics against creating "false hope" by aggressively marketing egg freezing to women as a guaranteed way of stopping their biological clocks. There still haven't been enough studies to know for sure how well long-term egg freezing works, according to the assessment. "Women who are considering doing this for elective reasons should understand that they are really at the leading edge of using this technology," Widra says, "and we're not yet certain that it will provide the promise that we hope it does." That said, Widra says he thinks it's probably going to work for women seeking to postpone childbearing. "How good an assumption that is, time will tell. But at this point, we think the available data are strong enough to say it's reasonable to do," he says. But the fertility society's shift is raising a lot of concerns. Some women's health advocates say there's still not enough data to really know how often frozen eggs actually produce healthy babies. The society's assessment was based on pregnancies, not healthy births, noted Amy Allina of the National Women's Health Network. In addition, the hormone injections needed to get eggs to freeze can, in rare cases, cause potentially life-threatening complications in women. "We're talking about a procedure that has some known risks and unknown benefits," Allina says. There's also the worry that the policy shift will fuel the creation of frozen egg banks. Marcy Darnovsky of the Center for Genetics and Society says that could lead to the exploitation of poor, younger women. "It's pretty evident that there's usually a difference in socio-economic status between the women who are being asked to sell their eggs or rent their wombs, and the women who are using it," she says. Some argue that society should make it easier for women to have kids when they are younger so they don't have to resort to technological fixes. "It's an example of using technology to solve social problems," says Adrienne Asch, a bioethicist at Yeshiva University. As for Anderson, she's just glad she had the option. "To be honest, it just, it really took a lot of the anxiety away from my personal life, I guess, and my efforts to date and to find the right person," she says. The fertility society plans to continue to collect data about the safety and effectiveness of egg freezing. In the meantime, Widra says the association hopes the new policy will encourage more insurance policies to pay for egg freezing.